It's hard to believe that more than a month has gone by since the pure F# MVC 5/Web API 2 and pure F# Nancy templates were released. One of the known issues with these templates was that they didn't appear in the Visual Studio Online Templates search. I'm happy to say that this issue has been resolved. 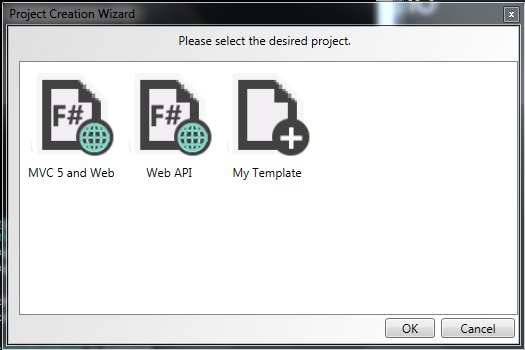 The approach taken to address this issue involved a custom implementation of IWizard and a simple WPF dialog. While I've created several of these in the past, until now it never seemed practical to create anything that could easily be reused. 1. Setup your solution as if it were a multi-project template by placing each template in it's own folder with the *.vstemplate file named as MyTemplate.vstemplate. Include an _definitions folder in the parent folder and create a <language>.vstemplate file within it. See https://github.com/fsharp/FSharpCommunityTemplates/tree/master/VisualStudio/Mvc5/TemplatePack/ProjectTemplates/Web for an example of how to setup the folder structure. 2. Make the XML in the _defintiions/<language>.vstemplate file similar to the following and update the TemplateData appropriately. folderName = This is the name of the folder created in step #1 that is associated with the template. The IWizard implementation will look into this folder and try to find a file with a name of MyTemplate.vstemplate. displayText = This is the text that will display in the WPF window for this particular template. icon = There are two options for icon: "FSharp" and "Generic". If you choose F#, then the icon for that template with include the text "F#", else it will not. 4. Install the MultiProjectWizard NuGet package. Note: This package includes DLLs such as EnvDTE and EnvDTE80. If your project already includes these DLLs, then you may need to remove the duplicate References after installing this package.